It might seem counterintuitive, but passengers on a budget who are focused on saving “every $5 they can” during the flight booking process can actually be tempted to spend money to upgrade their economy class seat when at the airport gate. 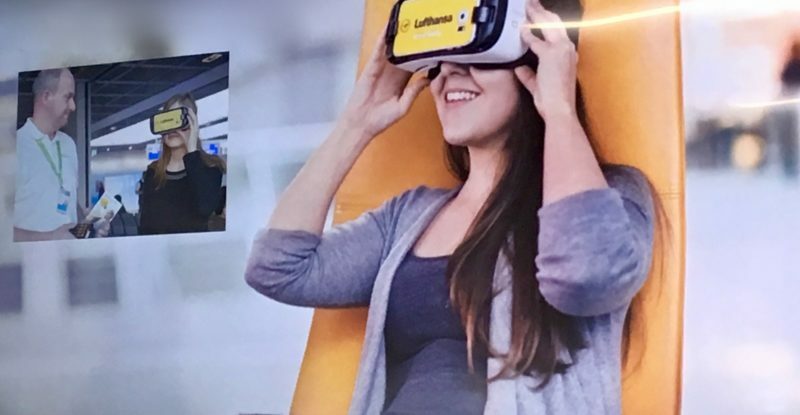 Just ask Lufthansa, which has tested what happens when you give passengers an immersive 360-degree view of its Premium Economy experience pre-flight using VR headsets. The trial, which was conducted last year in the United States and for the first half of this year in Frankfurt, revealed that when passengers are sitting at the gate and already “know what they’ve spent” on the flight, the hotel, the rental car, and so on, some will consider a $300 upgrade to Premium Economy as “something I do for myself” and then they spend the money, said Lufthansa Group senior director, product management, ground and digital services Bjoern Becker today at a Digitalization & Innovation Academy breakfast held in New York. Distributing VR headsets at checkin didn’t work for the carrier due to the rushed nature of checkin, and passenger anxiety about simply getting through the process, but, said Becker, “When we’re at the gate, it’s a totally different situation actually because – and this is the interesting part – people are relaxed and start looking forward to the flight….” Lufthansa saw an increase in upgrades to Premium Economy as a result of the VR experiment. The German operator believes this practice has the potential to ultimately be “very widespread” but there are challenges to overcome. “Today you have [Lufthansa] colleagues at the counter and the structure isn’t set up. And guests are not used to colleagues approaching them, but the interesting part of 360 is a lot of people don’t know the technology [and] haven’t experienced a destination in 360. [It’s] something we’d love to do further,” said Becker. Lufthansa is studying potential markets that have the infrastructure in place, and needs to talk to the airports about what it can and cannot do. “But so far it’s very promising and we’re very happy with the result,” he said. Enhancing the passenger experience whilst driving revenue in this fashion is smart, and it’s just the tip of the iceberg of what Lufthansa has in store for passengers. In December, the carrier will begin trialling facial biometric boarding in Los Angeles. It is also offering flight status information to passengers with the Apple Watch aboard its Inmarsat Global Xpress inflight connectivity-equipped aircraft in Europe (a project rolled out with partner Lufthansa Systems). 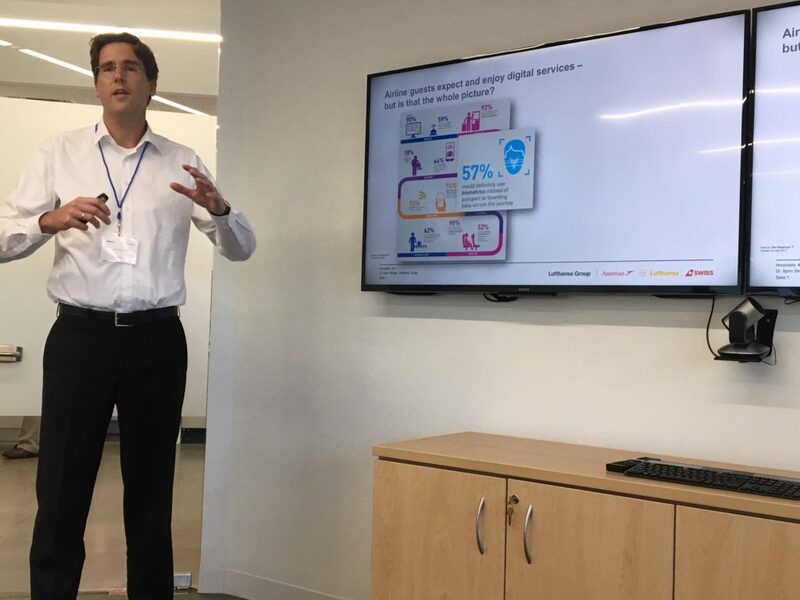 This is the “same data” as that which is offered on the inflight entertainment systems on long-haul aircraft, noted Lufthansa Group senior director of digital innovations Torsten Wingenter. And it means that passengers need not be interrupted in whatever else they’re doing. Lufthansa is also engaged in still-secret AI work that is aimed at making life easier for mobile, social, vocal travelers. And it will test “smart” crew uniforms in concert with Deutsche Telekom when it flies its FlyingLab testbed aircraft from Frankfurt to Las Vegas on 8 January for International CES. The aim is to see how Lufthansa can “better serve our guests” with smart technology, said Becker, noting that the airline has even invested in some coffee form printers to experiment with “printing” useful information and branding on lattes in lounges. In the past, Lufthansa has not been known for being on the cutting edge of innovation in #PaxEx, and it freely admits this fact. But that’s changing now, as the carrier seeks to harness the power of technology to delight, excite, inspire and engage with passengers, while also saving time and money to boot. 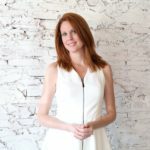 It seems the carrier realizes that economy travel shouldn’t simply be treated as a commodity; there are opportunities to differentiate at every touch point. The modern traveler will demand nothing less. Seems like a better strategy to enhance the pax experience instead of racing to the bottom like British airways. Lufthansa sure is trying to differentiate itself by attempting to improve the services and deal with the ever increasing competition in a smart way.